A group of young campaigners with sight loss travelled to the Houses of Parliament on 14th October to experience Westminster life and met with the Minister for Disabled People. The campaigners, aged 18-30 years, are part of a campaigning network called Envision set up by sight loss charity RNIB (Royal National Institute of Blind People). The event followed a ‘campaigner skills’ training day held at the charity’s London office. Justin Tomlinson, Minister for Disabled People, met with them during the visit to hear about the barriers that young blind and partially sighted people face when applying for jobs or staying in work. The campaigners want MPs to consider their experiences when making decisions surrounding employment. Elin Owen, 27 from Anglesey, said: “I enjoyed visiting Parliament and meeting other young people with sight loss who wanted to take action on important issues such as access to employment. The group took part in a tactile tour of Parliament and met with former Home Secretary David Blunkett. They had the chance to watch Prime Minister’s Questions, attended a debate in Westminster Hall discussing welfare cuts on disabled people, met an ITV journalist talking about press and politics and talked to an MP’s researcher. Launched in 2013, the Envision network provides an opportunity for like minded campaigners to get together and campaign on the issues that affect them. The focus for the group in 2015 is on employment issues such as Access to Work and the obstacles faced when applying for work. 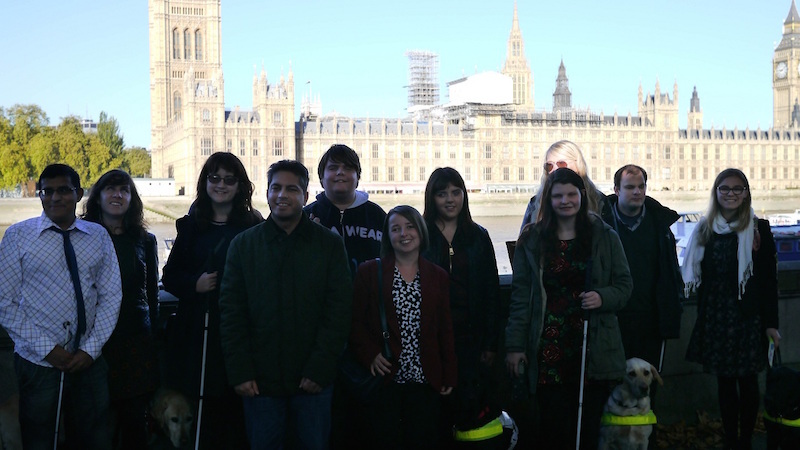 Be the first to comment on "Young blind and partially sighted campaigners meet with MPs during Parliament visit"